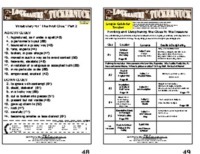 You can purchase the 104-page Unit with a 51-page Kids Wings literature guide and a 53-slide interactive Jeopardy-type game for Lost Treasure of Tuckernuck by Emily Fairlie for immediate download! Only $19.95! Principal Maria Tutweiler stood to welcome the first students to ever attend Tucknuck Hall Intermediate School. In her welcoming address, she challenged these Cluckers to find the treasure that had been hidden in the school. Can you imagine the excitement that rippled through the student body? A real treasure! Just waiting to be found! Eighty years later, the treasure remained hidden. Cluckers had come and gone, but for some reason, not one had a clue how to get started. The treasure was lost. Laurie Madison is not happy about becoming a Clucker. She thinks all the talk of treasure hunting, clucking and flapping and wearing chicken caps is stupid, and besides, her best friend, Kimmy, got to go to Hamilton Junior High. She didn't. Her only hope is her Clucker mom will change her mind and let her change schools. Now, things seem to be getting even worse when Laurie receives her classroom assignment. First, she is partnered with Bud Wallace! Bud Wallace! No one likes Bud Wallace because of what he did in his science fair project last year! If that's not bad enough, Mrs. Hutchins assigned them to do gerbil duty! Together! It was nothing short of disaster for a self-respecting sixth grader without a friend. But, soon, these vicious, blood-thirsty gerbils will lead Laurie and Bud into the greatest adventure of their lives beginning when one of the gerbils makes a dash for food and freedom. As the kids scramble to apprehend the escapee, Bud crashes into the founder's sacred chicken painting. It falls to the floor! What happens next closes the 80-year gap on the lost treasure. The first clue has been discovered, but what does it mean? Should they tell anyone? How can they decipher the clue? How many clues are there? Will they be able to find the treasure without being hijacked by the snoopy Calloipe? Lost Treasure of Tuckernuck will take you on a wild, hysterical ride through impossible problems, a conniving classmate, weird teachers, a principal with a secret sweet-tooth, and an evil school-board member bent on closing and demolishing the treasured school. You'll have the opportunity to try to problem-solve and decipher the clues with Laurie and Bud! Along the way, you'll face a plethera of vocabulary you'll come to treasure as well as authentic sticky notes, email, and forbidden notes that are being passed throughout the story. 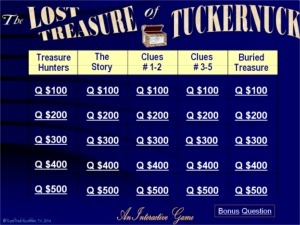 Lost Treasure of Tuckernuck will be a book you'll want to take undercovers at home or under your desk at school. Teachers will want a class set to enable you and your classmates to break the code-clues together. 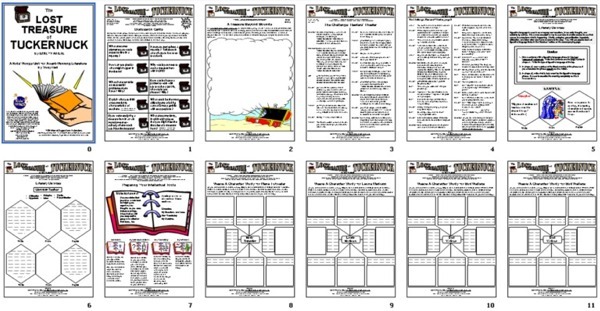 The Kids Wings 104-page literature guide with interactive Jeopardy-type game, perfect for lesson plans, handouts, or projection on your SmartBoard for Lost Treasure of Tuckernuck is now available! A terrific treasure-hunting book set in New York! with Kids Wings literature guide and a Jeopardy-type game! with Kids Wings literature guide! Buy Lost Treasure of Tuckernuck by Holly Goldberg Sloan NOW!